Rare and original, 1860's Civil War Quarter Plate Tintype Photograph of an armed United States Army Soldier with rifle, fixed bayonet, kepi and cartridge box!! This original, period Tintype Photograph measures approx. 3 1/8" by 4 1/8" and is housed in one half a period, pressed paper hard case with original matt but lacking binding and cover glass. The Tintype is a full length portrait of a Civil War Union Soldier standing at near attention with his rifle (with fixed bayonet) held in front of him. He wears a kepi on his head, a somewhat odd shaped belt plate, an eagle shoulder strap plate and a leather cartridge box. Neither the subject nor the photographer are identified in any way. 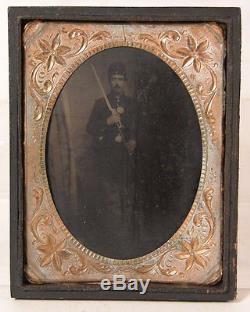 This rare and original, Civil War Tintype Portrait of a Union Soldier is in good condition only. It is somewhat darkened overall and although the surface does not appear to be damaged, the right half of the Image is rubbed resulting with the loss of detail in this area of the plate. The 1/2 Hard Case is somewhat worn and although the Photograph retains what appears to be its original stamped brass matt, it lacks the stamped brass binding and the original cover glass. A very rare and original, 1860's Civil War Quarter Plate Tintype Photograph of an armed United States Army Soldier with rifle, fixed bayonet, kepi and cartridge box and with all faults still a nice addition to any collection! And Click Here to Add Us To Your Favorite Sellers List. Click Here to Discover More About this Item and Many Others on Our New Informational / Non-Commercial / Reference Blog - Walnutts. The item "1860's CIVIL WAR 1/4 PLATE TINTYPE PHOTO OF UNION SOLDIER ARMED WITH RIFLE" is in sale since Friday, July 03, 2015. This item is in the category "Collectibles\Militaria\Civil War (1861-65)\Original Period Items\Photographs". The seller is "walnutts" and is located in Brewster, Massachusetts. This item can be shipped worldwide.